Of course, a variety of group perennial flowers can not boast. But among them there are extremely popular beauties, which will make the mood a variety of and will decorate flower beds, planters, curb strips. 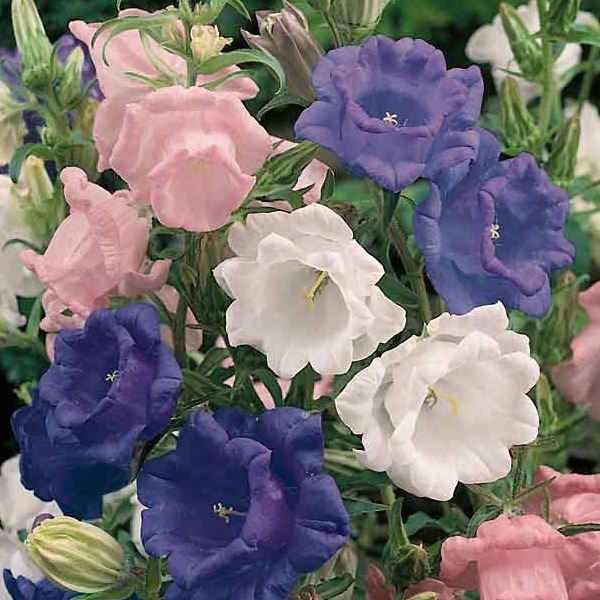 Group of flowers - biennials is that they can be leisurely to sow the seeds in June directly in the country, bypassing the seedling method of cultivation. In the year of sowing the seedlings grow, forming a nice rosette of leaves and overwinter for the next year bloom profusely. Some of them bloom and in the third year, but flowering already dramatically loses its decorative effect. The bell average. Very small seeds, so sow them almost superficial. So the soil dries quickly , planting can be held in a shaded place, such as somewhere under an Apple tree. Seedlings appear after two weeks. Fragile the seedlings in late summer and planted in a permanent place. Soil for bells suitable fertile, without stagnant water in the light. During the winter, "kindergarten" it is better to cover the peat. The bells are a very beautiful group planting on lawns, perennial borders and mixed borders. The flowers are fragrant and stylish look in bouquets. In colder regions where the summer is short, it is preferable to sow the seeds in late may. 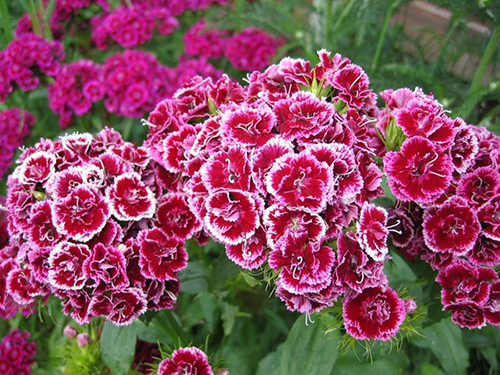 Carnation bearded (Turkish). Seeds are sown directly into the flower bed. Later rises cloves 8...10 days to the place of origin is undemanding. Wonderful blooms 1.5 months even in shaded areas on fertile soils, where there is no water stagnation. It hibernates well, but from mice of the Turkish cloves need to cover with spruce branches, thorns from blossoms mugs. Planted on rocky areas, mixed borders adjacent to perennial flowers will always be successful and beautiful look. Low varieties suitable for growing in pots and on balconies. The flowers have a unique flavor. They cut a long stored in water. Mallow or stem rose. 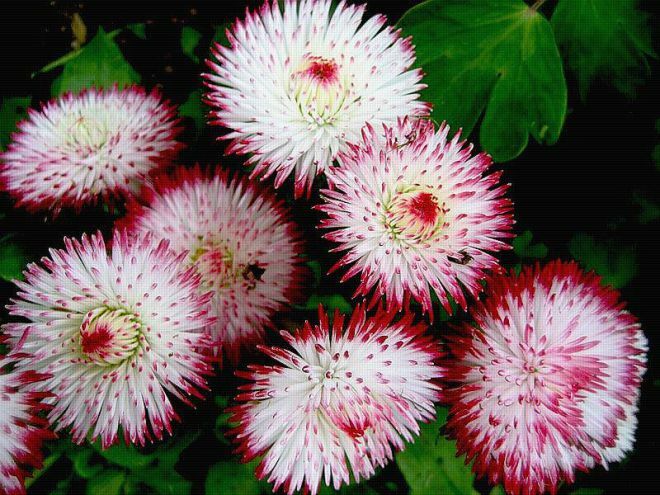 Modern double varieties are popular today, although plants with simple flowers are very decorative. The seeds are quite large and sow them it is necessary at once to its place. Germinate after 10 to 12 days. Plants have resistance to drought, like light, fertile soil and require in dry weather in summer, copious waterings. But wet soils can not tolerate. In winter, the seedlings need to cover the peat. 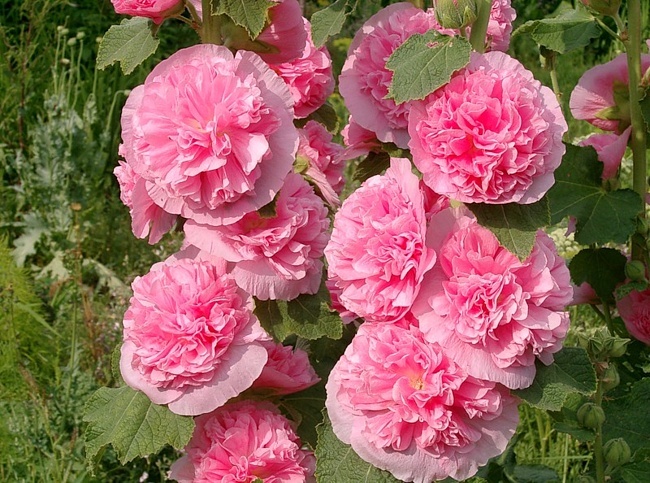 The hollyhocks look great as a specimen on lawns. They are planted along fences and walls. Cut flowers are good in bouquets and in the water half the buds open. Daisy. Small seeds germinate in 5-10 days. Plants are perfectly adapted and bloom even in the heavy, moist, fertile soil in partial shade and in the sun. Give self-seeding. Daisy with good care can bloom almost continuously. They are planted in different flower beds, pots, balcony boxes. Cut flowers are nice in the water and they make small corsages (buttonholes) and composition. Forget-me-not. After sowing in 12 -- 14 days shoots appear. 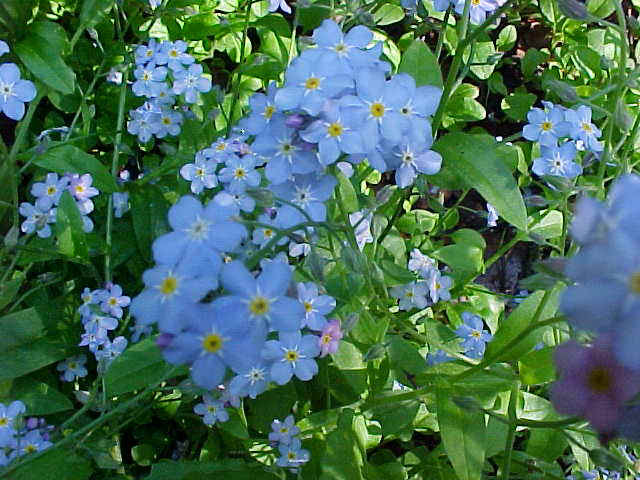 Forget-me-nots grow in moist fertile loamy soils without water stagnation. The best place for them is under trees and shrubs. In full sun, in dry weather quickly lost decorative. Forget-me-nots are planted in groups of bulbous plants of the spring bloom on the lawn near the trees. Digitalis. Medicinal and ornamental plant, the flowers are similar to bells. Plants up to 150 cm. Seeds are small. 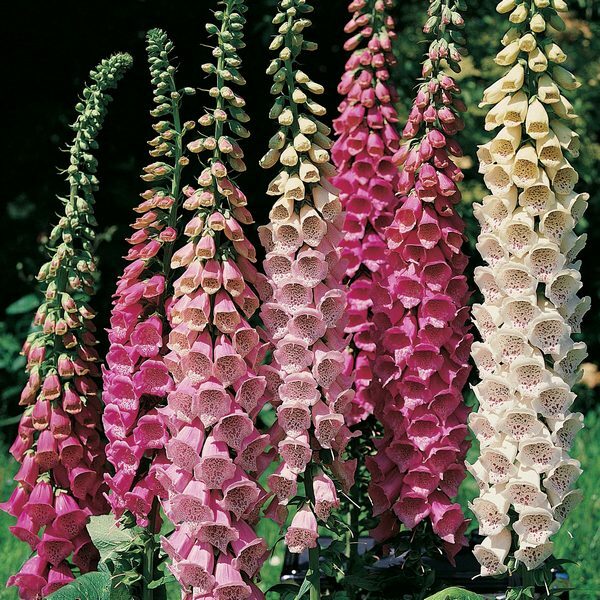 Planted Foxglove in areas with fertile, friable soil without stagnant water. Winters well. Drought-resistant and light-requiring. Digitalis beautiful when planted as separate groups on the lawn and in the neighborhood with other flowers in mixed borders. The whole plant is poisonous, so they are not planted on playgrounds and in places where there are small children. 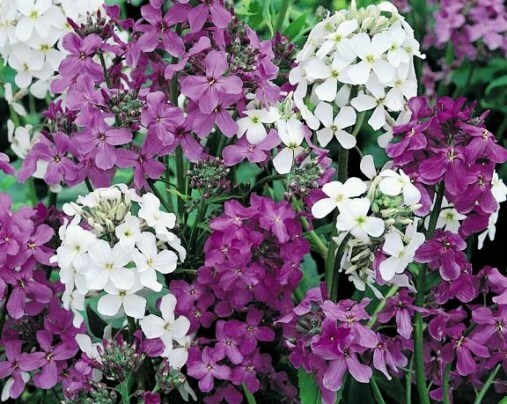 Hesperis, or noctule (noctule Matron). The plant belongs to the cabbage family. Seeds germinate well. The plant is undemanding to growth, but acidic soils do not like. Flowering plants grow more than 1 m in height. It should be a time to sow, and it will take root at the site for a long time. The fact that noctule liberally sprinkles his seeds after flowering. This is bad and good. Too bad that account or it to transplant (which she is not afraid), or remove entirely, where she is "out of place". But for all its little flaws, noctule reward the owners charming fragrance of their simple flowers similar to Phlox. A particularly strong flavor appears in the evening hours. Pansies (viola). The seeds germinate in 8 to 10 days. Fledgling kids are planted in flower beds in late August - early September, with the distance between them is 15...20 see Selection of species and colors is very large. In dry weather require constant copious irrigation. 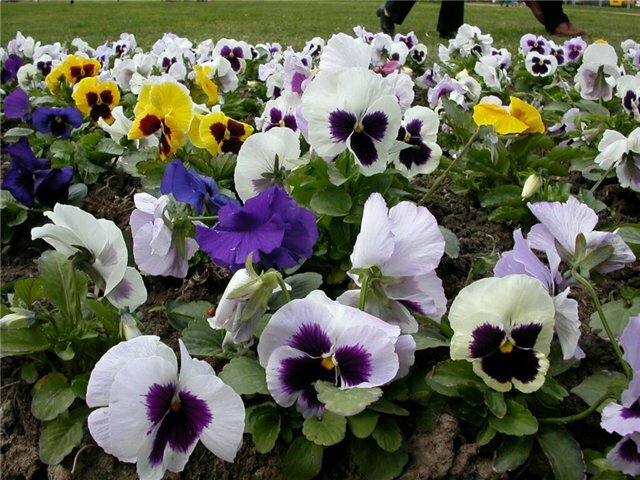 In landscaping "pansies" are widely used. 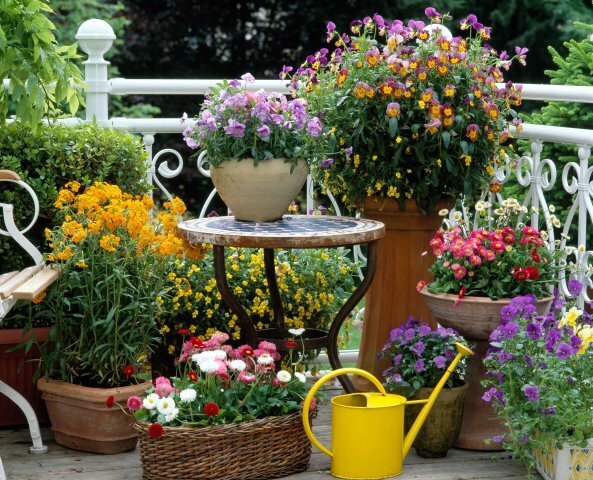 They are planted in flower beds, lawns, containers, flowerpots, balcony boxes. Pansy loved by peoples of many countries.